I woke up around 6 a.m. and went to the bathroom in my railcar to brush my teeth and put in my contacts. I was in a train full of Norwegian soldiers about my age. We arrived in Oslo about 7 a.m.
Once at the station, I went to insert more money in my locker and grab a full Norwegian breakfast at the café in the station. I reserved my seat on the 8:05 a.m. train to Lillehammer and bought my return on the 20:00 p.m. train back to Oslo. My goal was to ski and bobsled during the day in the country where winter sports were practically invented! 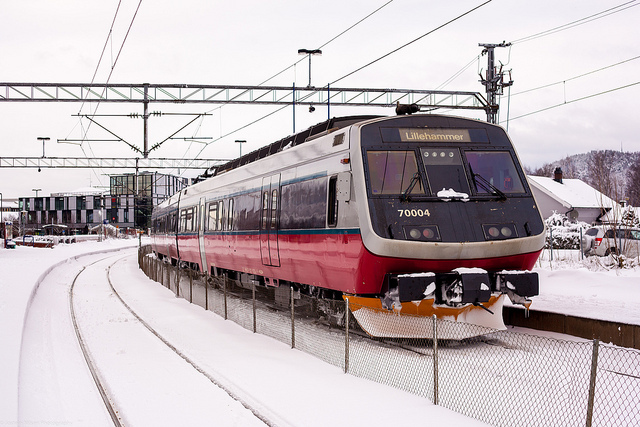 My train arrived in Lillehammer, home of the 1994 Winter Olympics at 10:15 a.m. When I arrived I walked around 20 minutes or so until I found the tourist information station where I inquired about skiing. I bought some new gloves since I lost my other pair in Stockholm and headed back towards Lillehammer train station. My bus to Hafjell ski resort would leave at 13:05 p.m. so I killed time by reading and grabbing a quick sausage dog for lunch. My bus left at 13:05 p.m. and arrived at Hafjell at about 13:20 p.m. I bought my lift ticket and rented my skis, poles and boots before hitting the slopes at 13:30 p.m. I used a three-hour pass and skied until 16:30 p.m. when the lifts shut down. It was really cool (literally) to zoom down the course of the 1994 Olympic games. I even hit the slalom course once even though I wasn’t supposed to. I was able to get in about 10 runs because the lift wasn’t an express and the slopes were not very long. It was extremely cold and windy but worth every dollar. The views from the slope were incredible, especially at sunset which starts around 15:30 p.m. but takes a while to set. I skied for about 45 minutes under floodlights which were very beautiful with the mountains lit up and with alpenglow in the distance. It was also pretty peering out at snowy firs surrounding the frozen lakes below. Then I turned in all of my equipment before going to get my stuff out of my locker. How was the Norwegian ski experience different from my stomping grounds in California’s Sierra Nevada? One difference was the lift tickets you would wear a magnetic card on an elastic cord and feed it into a machine that would open the gate allowing you to get on the lift. Other differences included not as many lifts or express lifts but less people on the slopes. The views were equally outstanding, although I prefer the Tahoe view from Heavenly. I then caught the bus back to Lillehammer train station and was able to change my departure time so I could leave earlier for Oslo at 19:15 p.m. and arrive at 21:45 p.m. I found a hotel with a sink, nice bed, TV and hall bath for about $50 and went up to my room. I watched TV and read for two hours before going to bed. What a great day I had. 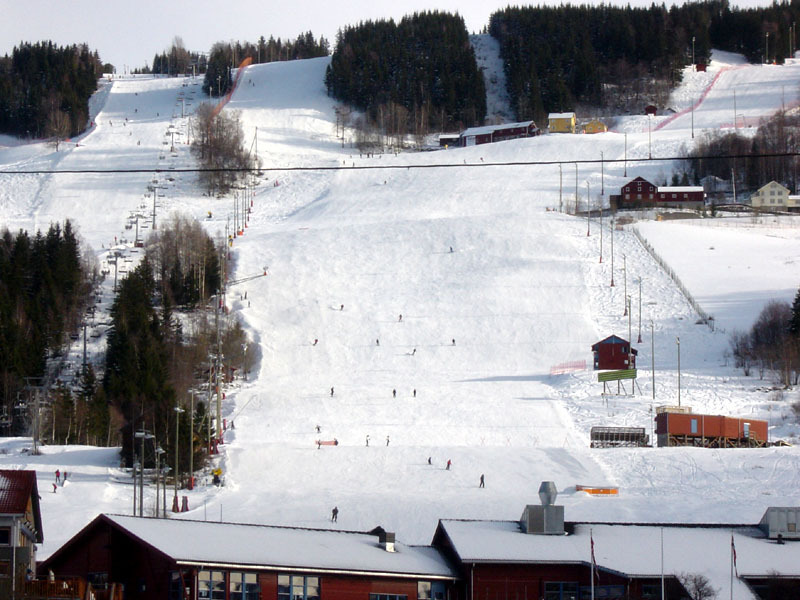 I never thought I would ski the Olympic downhill course in Norway!